The ‘Parts Strat’, or 'Partscaster' is the bane of the secondhand guitar buyer’s life. There are unthinkable numbers of them. Mongrel assemblies of components from two or more Stratocasters, which have no appeal to collectors, and therefore little real terms value on the market. 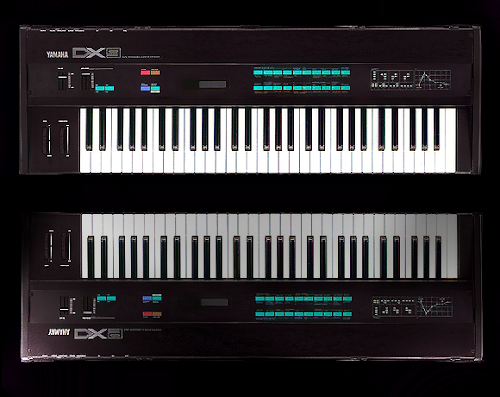 To understand why the ‘parts Strat’ is such an abomination on the secondhand market, it’s necessary to recognise what it really is. In many cases, an owner will have been in possession of two Strats, and, not being satisfied with either of them, will have chosen to make one good Strat with the best parts from both. The owner has then kept the good Strat, and put the other one up for sale. So whilst ‘parts Strats’ are not in any way bad as such, the ones you find on the market are frequently the throwaways. The collections of all the parts the previous owners didn’t want. The worst neck, on the worst body, with the worst pickups, the worst tuners… You get the idea. Compounding the problem further, these parts were not specifically made to go together, and they often won’t fit together as well as they should. And since the previous owner didn’t give a stuff about this reject guitar and knew he/she wasn’t going to keep it, he/she is hardly likely to have spent much time setting it up nicely. Regularly, these undesirable 'throwaways' are sold with an implication that they’re original, factory-spec guitars. What you get, as my grandmother would have put it, is a “pig in a poke”. Surfin’ USA, or Surfin’ MIK? A ‘parts Strat’ only needs a simple refinish to the headstock face and a ‘knock-off’ transfer to start fooling large numbers of guitarists. And it’s not just novices who are taken in. Dodgy Strats with ‘rogue branding’ can convince entire guitar forums that they’re authentic. Some people expect ‘parts Strats’ to have bits hanging off them and be decked out with washing machine knobs, but that’s rare. At first glance, some ‘parts Strats’ look very impressive. Their owners may not want them, but they certainly want other people to want them, and on that basis they’ll make them look as attractive as they possibly can. The first step, is to assess the manner of the seller and the language they’re using. 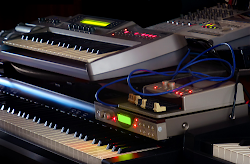 One of the most common tactics among those who are trying to sell some jumble of reject parts is to play dumb. “I/we think it’s this…”, “It was sold to me/us as that…”, etc. Particularly if they’re specialist guitar dealers, sellers will know exactly what it is they’re selling, so never accept any of this kind of non-committal language. You need a categorical, written guarantee that what you’re buying is precisely what the seller is leading you to believe. Ideally you want “[specific model name] - all original parts” in writing. Failing that, “[specific model name] – all original parts, except…”. The latter forces an exhaustive list of what’s been changed. This way, if the guitar turns out to be something you didn’t expect, you’re legally entitled to a refund. If the seller won’t give you a categorical statement, or they claim they “don’t know” / “can’t be 100% sure”, be very wary about parting with your money. Bear in mind when buying from a Web seller who starts playing dumb, that if someone can use the Web to sell a guitar, they can and will use the Web to find out what they’re selling. The same dynamics apply to people selling supposedly more valuable instruments on the cheap or at a seemingly unnecessary discount. 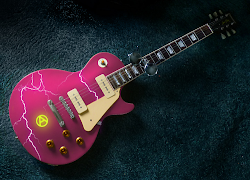 Reverse the situation: if you were selling a guitar, would you a) verify that it was genuine and charge the full market value for it, or b) throw away £hundreds selling what you suspected to be a thoroughbred guitar at half price, because you couldn’t be bothered to make a simple check? We’re all the same. We’re always gonna aim for as much money as possible on a sale. If someone is offering something for much less than its apparent value, you can be pretty sure it’s not what they’re making it out to be. Pickup changes are rife on Strats, so check the pickups. Even before taking off the scratchplate you can check that the pole-pieces match from unit to unit. Is one pickup flush-poled and another one staggered? Or does one pickup have bevelled poles whilst the others have unbevelled? Are the poles on one pickup duller or shinier than the poles on the others? Also, check for differences in colour on the pickup covers. If the covers were originally white or ‘pre-aged’, they’ll discolour at a fairly uniform rate over time. Covers with slight mismatches in colouring often indicate pickup changes and tampering. You’ll sometimes need daylight to see the subtleties, but if you look carefully enough, mismatches in the pickups and their covers are normally detectable without dismantling the guitar. Of course, if all the pickups were changed at the same time with a matched set, you won’t see any discrepancies. But often, ‘parts Strats’ are used to get rid of 'waste' components, and that sometimes means mismatched odds and ends. The rear of the headstock often reveals evidence of changes to the tuners. 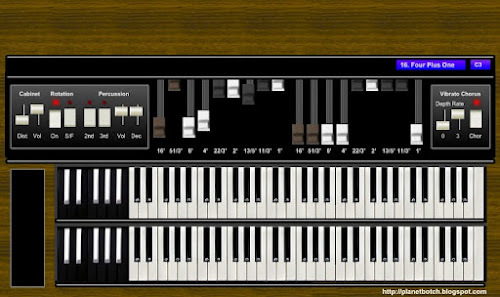 This image shows how things should look on an all original guitar. The headstock is that of a mint Fender MIJ ’62 Strat reissue. There are no indentations or excess screw holes around the machineheads, and the screws holding the tuners to the guitar show no evidence of being turned by the owner. ... And Parts City. The all too familiar evidence of a doctored guitar. This is somewhere not everyone looks when buying a guitar, but it's very common to find evidence of 'parts Strat' status around the machineheads. Notice that in addition to the excess holes and indentations, the screws don't match up in terms of apparent age, and range from seemingly quite old, to shiny and new. 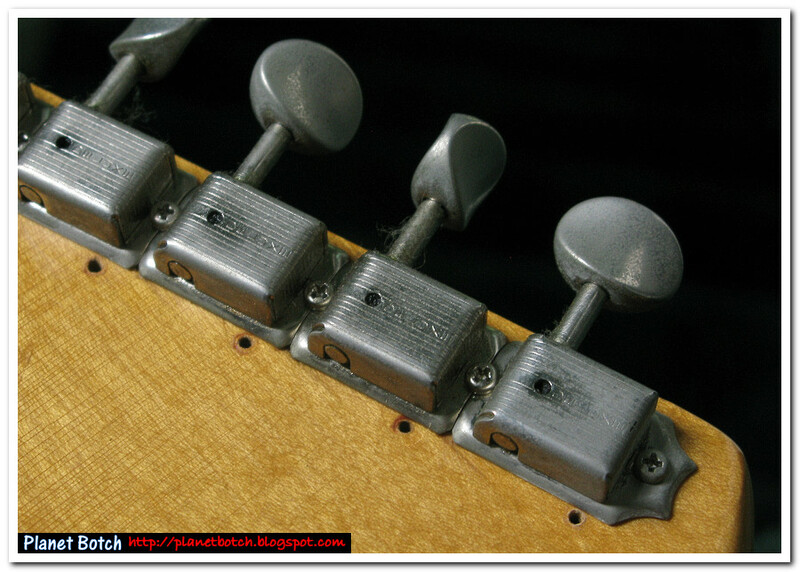 Inspect around the machineheads, front and back, for any unused screw holes, filled screw holes, or indentations in the headstock which would not have been made by the current tuners. Also, check the heads of the screws holding the tuners to the guitar. These screws would not have any cause to be tampered with unless the tuners had been removed for some reason, so if any of the screw heads show signs of screwdriver wear, be highly suspicious. 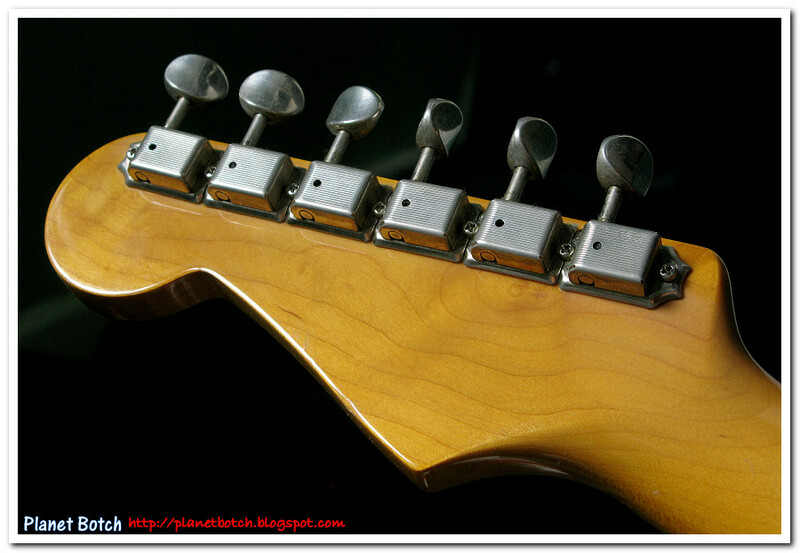 ‘Unverified’ Strats on the market often have non-original machineheads. Inspect the front face of the headstock for holes or filled holes just above the nut. Some ‘parts Strat’ necks have had their string locks removed to comply with ‘vintage’ spec. I’ve actually seen a Strat with one of these necks being sold as a "JV" instrument by a dealer. An expert would have laughed his/her head off when offered that guitar and responded with the phrase: “On yer bike!” or similar. But how many buyers are experts? Unscrupulous dealers will play these games because they know a lot of potential buyers don’t know what to look for. You should also be aware that it’s not unheard-of for dealers to stick price labels over defunct screw holes. If a dealer has used a stick-on price label, make sure you remove it before you buy! Whilst on the subject of the headstock, check that the finish on the front face matches that on the back. Many purveyors of ‘parts Strats’ will want rid of an undesirable logo, but few will be bothered to refinish the entire neck. The result? A re-logo’d and refinished headstock face which is either a slightly different wood shade from the rest of the maple on the neck, or which has been sprayed a solid colour to match the body, like an early ‘60s, surf-era Fender. As well as assessing the shade of the wood, carefully look at the surface patina of the finish against the light. Does the general aura of the finish on the headstock face match that of the rest of the neck?… Be acutely aware that refinishing and ‘re-branding’ a headstock is very simple for forgers to do, and with so much extra money at stake, the unscrupulous will deem it an operation well worthwhile. 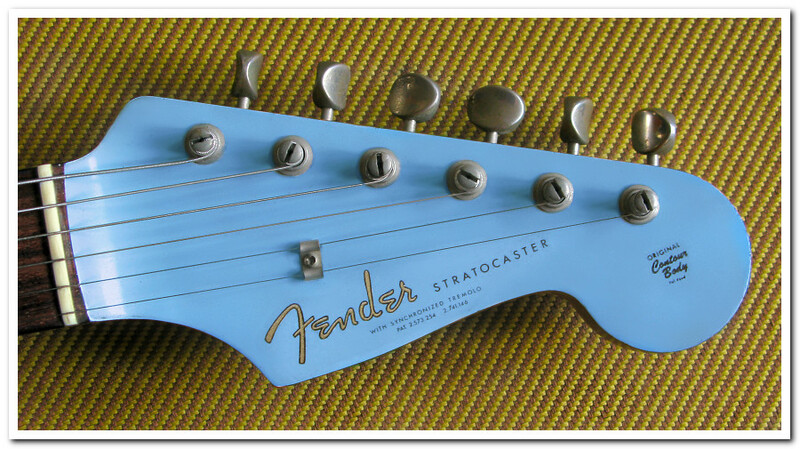 Note, however, that in the late '60s, Fender Strats did have a different finish type on the headstock face. This should be taken into account, but the purchase of something as valuable as a '60s Fender Strat should in any case encompass verification way beyond the scope of this article. Inspect the edges of the body for any signs of plywood construction – as indicated by a slight sinking of the finish into the pattern of the stacked wood layers. Better plywood Strats will have sealed or veneered body edges, so you may not see any evidence without dismantling the guitar, but under the scratchplate, you'll probably see signs of the stacked wood layers up the walls of the pickup cavities and/or in the neck pocket. Plywood construction, however, will not always be evident. If the finish is thickly applied it can obscure the wood layers in the walls of the body cavities and even the neck pocket. So look for evidence of plywood, but if you don't see any, don't assume the body is definitely made from solid wood. If you do find evidence of plywood, though, it should of course be an obstacle to buying what was spec'd by the manufacturer as a solid wood guitar. Sounds ridiculous, but the number of cheap, plywood bodies which have, over the years, ended up with 'Fender' necks on them, is shocking. Whilst looking at the finish, also be suspicious of any unusual ‘wear and tear’. Does the body look like it’s been deliberately ‘aged’ or sanded? Creating a legitimate ‘relic’ is fair enough, but so often, these tricks are performed merely to hide evidence of plywood construction, to make filled screw holes or indentations harder to spot, or to conceal a disparity in finish type between neck and body. Look carefully at the neck pocket and around the neck plate. Chips in the finish of the body either side of the neck pocket, literally along the edge of the neck slot, are very difficult to inflict unless the neck has been completely removed. Think about it – do glued-neck guitars have chips right in those corners on the edges of the neck pocket? Well, I’ve never seen one. Most often, those chips are the result of switching necks, and forcing a neck from an alien guitar into a pocket that’s too tight. Also, look for pressure cracks and/or ‘imprints’ in the finish around the neck plate. These don’t necessarily prove the neck has been changed, but if the truss rod adjustment is on the headstock face and the neck doesn’t need to be removed, they do indicate that at least one previous owner has been prone to tinkering with the guitar. A poor fit with a wide gap between neck and body around the neck slot would also be a cause for suspicion – especially on a supposedly mid to higher priced Fender Strat (the early Mexican Fenders are one exception to this I'm aware of). The classic sign of a neck switch. 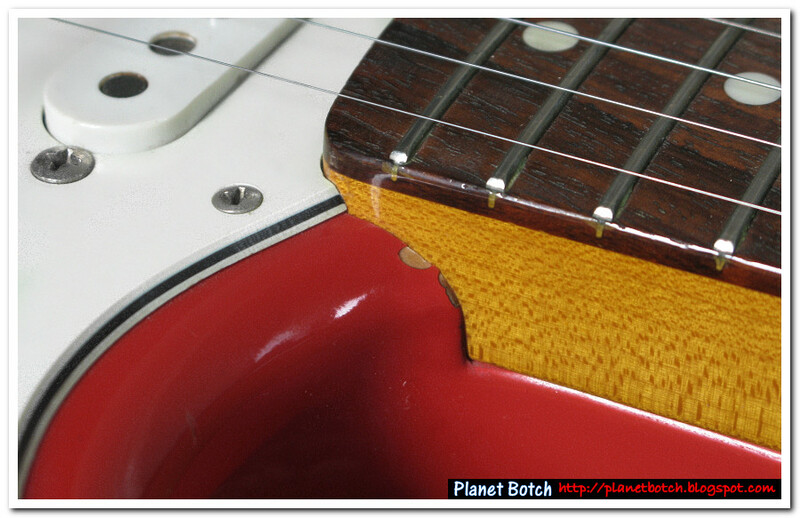 This ‘parts Strat’ has tell-tale chips in the paintwork along the edge of the neck pocket – caused by forcing in a neck that’s a little too wide. If you’re getting more serious about the guitar, check beneath the scratchplate to ensure all the mounting screw holes line up with the scratchplate’s own holes, and that there aren’t any extra, unused screw holes. Extra screw holes, and ‘misfired’ screw holes in the body around the outline of the scratchplate’s edge are a classic sign that the scratchplate has been switched. If the plate has been switched, chances are it won’t be the only thing. Check the electrics (especially the bases of the tone and volume pots) for any ‘unnecessary’ solder blobs, or enlarged solder joins which appear out of keeping with the rest of the soldering. 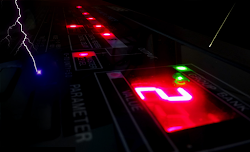 And be very suspicious – pickups and electrics are one of the most ubiquitous areas of tinkering. If there’s solder in places where it’s not needed, someone’s almost certainly been a messin’. Make a list of questions to ask about the guitar, and make sure you get straight answers. In particular, try to find out whether the seller is (or claims to be) the first owner, and if not, how they acquired the guitar. You probably won’t learn much in terms of hard info about the Strat itself, but you will get a sense of whether the seller is trying to gloss over any irregularities with vague language, and whether he/she wants to pin the onus of verification on someone else, who conveniently can’t be traced. Ask questions about features if you’re unsure about anything, but most importantly, ask how you know the guitar being sold is not a ‘parts Strat’. Don’t be afraid to ask that question. Any answer other than: “I will guarantee that it’s not a ‘parts Strat’” (or words to the same effect), is in my opinion unacceptable. The checks outlined above are not guaranteed to unearth a ‘parts Strat’, and obviously if you were spending a very large sum on a vintage original it would be wise to get an expert to check it over. Equally, it could be that a guitar displaying many of the traits of tampering has merely been disassembled, changed, and then reverted back to original spec. But signs of tampering are going to make a guitar much harder to sell anyway, so you should still be wary of something which looks like it’s been messed with. The most important thing is not to trust anyone. Even supposedly reputable dealers – middle aged men, in smart attire, in high street shops – can take you to the cleaners. They’re not all like that, obviously, but some are, and dodgy dealers won’t have the words “I am a crook” tattooed across their forehead. They’ll usually come across as nice, accommodating guys. None of this is to say that ‘parts Strats’ are in themselves pure evil, obviously. Some outlets build Strats to order from user-specified components. Those are technically ‘parts Strats’ and yet they can be exceptionally good guitars. However, whilst dealer-assembled ‘parts Strats’ might perform extremely well, they still typically suffer from the inherent problem of low collector appeal, and thus they’re not well known for maintaining a good resale value. Not bothered about resale value? Fine. But that’s only because you’re buying, and not selling. Believe me, if you need to sell at any point, you will be bothered about resale value. The ‘parts Strat’ doesn’t by definition have to be inferior to a thoroughbred, and it could feasibly be significantly better. But the reality is that on the market, the ‘parts Strat’ as a general entity is easy to buy, and extremely difficult to sell. You need to know one when you see one. In connection with this subject, you may wish to have a look at Where Are the REAL Vintage Strats?